Proprietary Name: Yosprala What is the Proprietary Name? Non-Proprietary Name: Aspirin And Omeprazole What is the Non-Proprietary Name? 64950 - Genus Lifesciences Inc.
Yosprala with NDC 64950-425 is a a human prescription drug product labeled by Genus Lifesciences Inc.. The generic name of Yosprala is aspirin and omeprazole. The product's dosage form is tablet, film coated and is administered via oral form. Labeler Name: Genus Lifesciences Inc.
FDA Application Number: NDA205103 What is the FDA Application Number? YOSPRALA, a combination of aspirin and omeprazole, is indicated for patients who require aspirin for secondary prevention of cardiovascular and cerebrovascular events and who are at risk of developing aspirin associated gastric ulcers.The aspirin component of YOSPRALA is indicated for:reducing the combined risk of death and nonfatal stroke in patients who have had ischemic stroke or transient ischemia of the brain due to fibrin platelet emboli,reducing the combined risk of death and nonfatal MI in patients with a previous MI or unstable angina pectoris,reducing the combined risk of MI and sudden death in patients with chronic stable angina pectoris,use in patients who have undergone revascularization procedures (Coronary Artery Bypass Graft [CABG] or Percutaneous Transluminal Coronary Angioplasty [PTCA]) when there is a pre-existing condition for which aspirin is already indicated.The omeprazole component of YOSPRALA is indicated for decreasing the risk of developing aspirin-associated gastric ulcers in patients at risk for developing aspirin-associated gastric ulcers due to age (≥ 55) or documented history of gastric ulcers. Limitations of Use:YOSPRALA contains a delayed-release formulation of aspirin and it is not for use as the initial dose of aspirin therapy during onset of acute coronary syndrome, acute myocardial infarction or before percutaneous coronary intervention (PCI), for which immediate-release aspirin therapy is appropriate.YOSPRALA has not been shown to reduce the risk of gastrointestinal bleeding due to aspirin.Do not substitute YOSPRALA with the single-ingredient products of aspirin and omeprazole. Less Common Adverse ReactionsIn YOSPRALA-treated patients in the clinical trials there were 2 patients with upper GI bleeding (gastric or duodenal) and 2 patients with lower GI bleeding (hematochezia and large intestinal hemorrhage) and one additional patient experienced obstruction in the small bowel.See also the full prescribing information of aspirin and omeprazole products for additional adverse reactions. Risk SummaryUse of NSAIDs, including YOSPRALA, during the third trimester of pregnancy increases the risk of premature closure of the fetal ductus arteriosus. Avoid use of NSAIDs, including YOSPRALA, in pregnant women starting at 30 weeks of gestation (third trimester). There are no available data with YOSPRALA use in pregnant women to inform a drug-associate risk for major birth defects and miscarriage; however, there are published studies with each individual component of YOSPRALA. AspirinData from controlled and observational studies with aspirin use during pregnancy have not reported a clear association with major birth defects or miscarriage risk. However, NSAIDs, including aspirin, a component of YOSPRALA, may increase the risk of complications during labor or delivery and to the neonate [see Clinical Considerations and Data]. In animal reproduction studies, there were adverse developmental effects with oral administration of aspirin to pregnant rats at doses 15 to 19 times the maximum recommended human dose (MRHD) of 325 mg/day. Aspirin did not produce adverse developmental effects in rabbits [see Data]. OmeprazoleData from epidemiological and observational studies with omeprazole have not reported a clear association with major birth defects or miscarriage risk. Animal reproduction studies in pregnant rats and rabbits resulted in dose-dependent embryo-lethality at omeprazole doses that were approximately 3.4 to 34 times an oral human dose of 40 mg.Changes in bone morphology were observed in offspring of rats dosed through most of pregnancy and lactation at doses equal to or greater than approximately 34 times an oral human dose of 40 mg esomeprazole or 40 mg omeprazole. When maternal administration was confined to gestation only, there were no effects on bone physeal morphology in the offspring at any age [see Data].The estimated background risks of major birth defects and miscarriage for the indicated population are unknown. All pregnancies have a background risk of birth defect, loss or other adverse outcomes. In the U.S. general population, the estimated background risk of major birth defects and miscarriage in clinically recognized pregnancies is 2% to 4% and 15% to 20%, respectively. Fetal/Neonatal Adverse ReactionsMaternal aspirin use during the third trimester of pregnancy may increase the risk of neonatal complications, including necrotizing enterocolitis, patent ductus arteriosus, intracranial hemorrhage in premature infants, low birth weight, stillbirth and neonatal death. Maternal Adverse ReactionsAn increased incidence of post-term pregnancy and longer duration of pregnancy in women taking aspirin has been reported. Avoid maternal use of aspirin, including Yosprala, in pregnant women during the third trimester. Labor or DeliveryAspirin, a component of YOSPRALA, should be avoided 1 week prior to and during labor and delivery because it can result in excessive blood loss at delivery. In animal studies, NSAIDS, including aspirin, inhibit prostaglandin synthesis, cause delayed parturition, and increase the incidence of stillbirth. AspirinData from several controlled and observational studies with aspirin use in the first or second trimesters of pregnancy have not reported a clear association with major birth defects or miscarriage risk. Published data on aspirin use during pregnancy has been mostly reported with low dose aspirin (60 to 100 mg). There are limited data regarding aspirin 325 mg or higher doses used during pregnancy.A prospective, cohort study of 50,282 mother-child pairs (the Collaborative Perinatal Project) assessing adverse outcomes by level of aspirin exposure did not report aspirin-induced teratogenicity, altered neonatal birth weight, or perinatal deaths at any exposure level. In a controlled, randomized trial, maternal risks during pregnancy were reported as low or absent, with no demonstrated increased risk of maternal bleeding or placental abruptio. A multinational study involving more than 9,000 women, CLASP (Collaborative Low-dose Aspirin Study in Pregnancy)], found that low-dose aspirin reduced fetal morbidity in a select population of women with early-onset preeclampsia, but did not identify adverse effects in the pregnant woman, fetus, or newborn (followed to 12 and 18 months of age) in association with the use of low-dose aspirin during pregnancy. In contrast, some case-control studies reported associations between human congenital malformations and aspirin use early in gestation, but these studies did not report a consistent outcome attributable to drug use.A report from EAGeR trial (Effects of Aspirin in Gestation and Reproduction trial), which evaluated 1078 women who were attempting to become pregnant and had prior miscarriages, reported use of low-dose aspirin without adverse maternal or fetal effects except for vaginal bleeding. Another trial of 3294 pregnant women of 14 to 20 weeks of gestation treated with aspirin showed no effect in the mothers' incidence of pre-eclampsia, hypertension, HELLP syndrome or placental abruptio, or in the incidence of perinatal deaths or low birth weight below the 10th percentile. The incidence of maternal side effects was higher in the aspirin group, principally because of a significantly higher rate of hemorrhage.Use of NSAIDs, including aspirin, during the third trimester of pregnancy increases the risk of premature closure of the fetal ductus arteriosus and use of high-dose aspirin for long periods in pregnancy may also increase the risk of bleeding in the brain of premature infants. OmeprazoleFour published epidemiological studies compared the frequency of congenital abnormalities among infants born to women who used omeprazole during pregnancy with the frequency of abnormalities among infants of women exposed to H2-receptor antagonists or other controls.A population-based retrospective cohort epidemiological study from the Swedish Medical Birth Registry, covering approximately 99% of pregnancies, from 1995 to 1999, reported on 955 infants (824 exposed during the first trimester with 39 of these exposed beyond first trimester, and 131 exposed after the first trimester) whose mothers used omeprazole during pregnancy. The number of infants exposed in utero to omeprazole that had any malformation, low birth weight, low Apgar score, or hospitalization was similar to the number observed in this population. The number of infants born with ventricular septal defects and the number of stillborn infants was slightly higher in the omeprazole-exposed infants than the expected number in this population.A population-based retrospective cohort study covering all live births in Denmark from 1996 to 2009, reported on 1,800 live births whose mothers used omeprazole during the first trimester of pregnancy and 837,317 live births whose mothers did not use any PPI. The overall rate of birth defects in infants born to mothers with first trimester exposure to omeprazole was 2.9% and 2.6% in infants born to mothers not exposed to any proton pump inhibitor during the first trimester.A retrospective cohort study reported on 689 pregnant women exposed to either H2-blockers or omeprazole in the first trimester (134 exposed to omeprazole) and 1,572 pregnant women unexposed to either during the first trimester. The overall malformation rate in offspring born to mothers with first trimester exposure to omeprazole, an H2-blocker, or were unexposed was 3.6%, 5.5%, and 4.1% respectively.A small prospective observational cohort study followed 113 women exposed to omeprazole during pregnancy (89% with first trimester exposures). The reported rate of major congenital malformations was 4% in the omeprazole group, 2% in controls exposed to non-teratogens, and 2.8% in disease-paired controls. Rates of spontaneous and elective abortions, preterm deliveries, gestational age at delivery, and mean birth weight were similar among the groups.Several studies have reported no apparent adverse short-term effects on the infant when single dose oral or intravenous omeprazole was administered to over 200 pregnant women as premedication for cesarean section under general anesthesia. AspirinAspirin produced a spectrum of developmental anomalies when administered to Wistar rats as single, large doses (500 to 625 mg/kg) on gestational day (GD) 9, 10, or 11. These doses (500 to 625 mg/kg) in rats are about 15 to 19 times the maximum recommended human dose of aspirin (325 mg/day) based on body surface area. Many of the anomalies were related to closure defects and included craniorachischisis, gastroschisis and umbilical hernia, and cleft lip, in addition to diaphragmatic hernia, heart malrotation, and supernumerary ribs and kidneys. In contrast to the rat, aspirin was not developmentally toxic in rabbits. OmeprazoleReproductive studies conducted with omeprazole in rats at oral doses up to 138 mg/kg/day (about 34 times an oral human dose of 40 mg on a body surface area basis) and in rabbits at doses up to 69.1 mg/kg/day (about 34 times an oral human dose of 40 mg on a body surface area basis) during organogenesis did not disclose any evidence for a teratogenic potential of omeprazole. In rabbits, omeprazole in a dose range of 6.9 to 69.1 mg/kg/day (about 3.4 to 34 times an oral human dose of 40 mg on a body surface area basis) administered during organogenesis produced dose-related increases in embryo-lethality, fetal resorptions, and pregnancy disruptions. In rats, dose-related embryo/fetal toxicity and postnatal developmental toxicity were observed in offspring resulting from parents treated with omeprazole at 13.8 to 138 mg/kg/day (about 3.4 to 34 times an oral human doses of 40 mg on a body surface area basis), administered prior to mating through the lactation period. EsomeprazoleThe data described below was generated from studies using esomeprazole, an enantiomer of omeprazole. The animal to human dose multiples are based on the assumption of equal systemic exposure to esomeprazole in humans following oral administration of either 40 mg esomeprazole or 40 mg omeprazole.No effects on embryo-fetal development were observed in reproduction studies with esomeprazole magnesium in rats at oral doses up to 280 mg/kg/day (about 68 times an oral human dose of 40 mg on a body surface area basis) or in rabbits at oral doses up to 86 mg/kg/day (about 42 times an oral human dose of 40 mg esomeprazole or 40 mg omeprazole on a body surface area basis) administered during organogenesis.A pre- and postnatal developmental toxicity study in rats with additional endpoints to evaluate bone development was performed with esomeprazole magnesium at oral doses of 14 to 280 mg/kg/day (about 3.4 to 68 times an oral human dose of 40 mg esomeprazole or 40 mg omeprazole on a body surface area basis). Neonatal/early postnatal (birth to weaning) survival was decreased at doses equal to or greater than 138 mg/kg/day (about 34 times an oral human dose of 40 mg esomeprazole or 40 mg omeprazole on a body surface area basis). Body weight and body weight gain were reduced and neurobehavioral or general developmental delays in the immediate post-weaning timeframe were evident at doses equal to or greater than 69 mg/kg/day (about 17 times an oral human dose of 40 mg esomeprazole or 40 mg omeprazole on a body surface area basis). In addition, decreased femur length, width and thickness of cortical bone, decreased thickness of the tibial growth plate and minimal to mild bone marrow hypocellularity were noted at doses equal to or greater than 14 mg/kg/day (about 3.4 times an oral human dose of 40 mg esomeprazole or 40 mg omeprazole on a body surface area basis).Physeal dysplasia in the femur was observed in offspring of rats treated with oral doses of esomeprazole magnesium at doses equal to or greater than 138 mg/kg/day (about 34 times an oral human dose of 40 mg esomeprazole or 40 mg omeprazole on a body surface area basis).Effects on maternal bone were observed in pregnant and lactating rats in the pre- and postnatal toxicity study when esomeprazole magnesium was administered at oral doses of 14 to 280 mg/kg/day (about 3.4 to 68 times an oral human dose of 40 mg esomeprazole or 40 mg omeprazole on a body surface area basis). When rats were dosed from gestational day 7 through weaning on postnatal day 21, a statistically significant decrease in maternal femur weight of up to 14% (as compared to placebo treatment) was observed at doses equal to or greater than 138 mg/kg/day (about 34 times an oral human dose of 40 mg esomeprazole or 40 mg omeprazole on a body surface area basis).A pre- and postnatal development study in rats with esomeprazole strontium (using equimolar doses compared to esomeprazole magnesium study) produced similar results in dams and pups as described above.A follow up developmental toxicity study in rats with further time points to evaluate pup bone development from postnatal day 2 to adulthood was performed with esomeprazole magnesium at oral doses of 280 mg/kg/day (about 68 times an oral human dose of 40 mg on a body surface area basis) where esomeprazole administration was from either gestational day 7 or gestational day 16 until parturition. When maternal administration was confined to gestation only, there were no effects on bone physeal morphology in the offspring at any age. Risk SummaryThere is no information about the presence of YOSPRALA in human milk; however, the individual components of YOSPRALA, aspirin and omeprazole, are present in human milk. Limited data from clinical lactation studies in published literature describe the presence of aspirin in human milk at relative infant doses of 2.5% to 10.8% of the maternal weight-adjusted dosage. Case reports of breastfeeding infants whose mothers were exposed to aspirin during lactation describe adverse reactions, including metabolic acidosis, thrombocytopenia, and hemolysis. There is no information on the effects of aspirin on milk production. Limited data from a case report in published literature describes the presence of omeprazole in human milk at a relative infant dose of 0.9% of the maternal weight-adjusted dosage. There are no reports of adverse effects of omeprazole on the breastfed infant, and no information on the effects of omeprazole on milk production. Because of the potential for serious adverse reactions, including the potential for aspirin to cause metabolic acidosis, thrombocytopenia, hemolysis or Reye's syndrome, advise patients that breastfeeding is not recommended during treatment with YOSPRALA. Clinical ConsiderationsIt is not known if maternal exposure to aspirin during lactation increases the risk of Reye's syndrome in breastfed infants. The direct use of aspirin in infants and children is associated with Reye's syndrome, even at low plasma levels. FemalesBased on the mechanism of action, the use of prostaglandin-mediated NSAIDs, including YOSPRALA, may delay or prevent rupture of ovarian follicles, which has been associated with reversible infertility in some women. Published animal studies have shown that administration of prostaglandin synthesis inhibitors has the potential to disrupt prostaglandin-mediated follicular rupture required for ovulation. Small studies in women treated with NSAIDs have also demonstrated a reversible delay in ovulation. Consider withdrawal of NSAIDs, including YOSPRALA, in women who have difficulties conceiving or who are undergoing investigation of infertility. Juvenile Animal DataIn a juvenile rat toxicity study, esomeprazole was administered with both magnesium and strontium salts at oral doses about 17 to 67 times a daily human dose of 40 mg based on body surface area. Increases in death were seen at the high dose, and at all doses of esomeprazole, there were decreases in body weight, body weight gain, femur weight and femur length, and decreases in overall growth [see Nonclinical Toxicology (13.2)]. AspirinSalicylate toxicity may result from acute ingestion (overdose) or chronic intoxication. The early signs of salicylic overdose (salicylism), including tinnitus (ringing in the ears), occur at plasma concentrations approaching 200 mg/mL. Plasma concentrations of aspirin above 300 mg/mL are clearly toxic. Severe toxic effects are associated with levels above 400 mg/mL. A single lethal dose of aspirin in adults is not known with certainty but death may be expected at 30 g.
Signs and Symptoms: In acute overdose, severe acid-base and electrolyte disturbances may occur and are complicated by hyperthermia and dehydration. Respiratory alkalosis occurs early while hyperventilation is present, but is quickly followed by metabolic acidosis. Treatment: Treatment consists primarily of supporting vital functions, increasing salicylate elimination, and correcting the acid-base disturbance. Gastric emptying and/or lavage is recommended as soon as possible after ingestion, even if the patient has vomited spontaneously. After lavage and/or emesis, administration of activated charcoal, as a slurry, is beneficial, if less than 3 hours have passed since ingestion. Charcoal adsorption should not be employed prior to emesis and lavage.Severity of aspirin intoxication is determined by measuring the blood salicylate level. Serial salicylate levels should be obtained every 1 to 2 hours until concentrations have peaked and are declining. Acid-base status should be closely followed with serial blood gas and serum pH measurements. Fluid and electrolyte balance should also be maintained.In severe cases, hyperthermia and hypovolemia are the major immediate threats to life. Children should be sponged with tepid water. Replacement fluid should be administered intravenously and augmented with correction of acidosis. Plasma electrolytes and pH should be monitored to promote alkaline diuresis of salicylate if renal function is normal. Infusion of glucose may be required to control hypoglycemia.Hemodialysis and peritoneal dialysis can be performed to reduce the body drug content. In patients with renal impairment or in cases of life-threatening intoxication, dialysis is usually required. Exchange transfusion may be indicated in infants and young children. OmeprazoleReports have been received of overdosage with omeprazole in humans. Doses ranged up to 2400 mg. Manifestations were variable, but included confusion, drowsiness, blurred vision, tachycardia, nausea, vomiting, diaphoresis, flushing, headache, dry mouth, and other adverse reactions similar to those seen with recommended doses of omeprazole [see Adverse Reactions (6)]. Symptoms were transient, and no serious clinical outcome has been reported when omeprazole was taken alone. No specific antidote for omeprazole overdosage is known. Omeprazole is extensively protein bound and is, therefore, not readily dialyzable. In the event of overdosage, treatment should be symptomatic and supportive.If overexposure to YOSPRALA occurs, call your Poison Control Center at 1-800-222-1222 for current information on the management of poisoning or overdosage. Molecular FormulaThe empirical formula of aspirin is C9H8O4.The empirical formula of omeprazole is C17H19N3O3S. Molecular WeightThe molecular weight of aspirin is 180.16.The molecular weight of omeprazole is 345.4. Anti-platelet ActivityAspirin affects platelet aggregation by irreversibly inhibiting prostaglandin cyclo-oxygenase. This effect lasts for the life of the platelet and prevents the formation of the platelet aggregating factor thromboxane A2. Nonacetylated salicylates do not inhibit this enzyme and have no effect on platelet aggregation. At higher doses, aspirin reversibly inhibits the formation of prostaglandin I2 (prostacyclin), which is an arterial vasodilator and inhibits platelet aggregation. Antisecretory ActivityThe effect of YOSPRALA 325 mg/40 mg tablets on intragastric pH was determined in a study of 26 healthy subjects dosed for 7 days. The mean percent time intragastric pH >4.0 was 51%. Serum Gastrin EffectsIn studies involving more than 200 patients, serum gastrin levels increased during the first 1 to 2 weeks of once-daily administration of therapeutic doses of omeprazole in parallel with inhibition of acid secretion. No further increase in serum gastrin occurred with continued treatment. In comparison with histamine H2-receptor antagonists, the median increases produced by 20 mg doses of omeprazole were higher (1.3 to 3.6 fold vs. 1.1 to 1.8 fold increase). Gastrin values returned to pretreatment levels, usually within 1 to 2 weeks after discontinuation of therapy.Increased gastrin causes enterochromaffin-like cell hyperplasia and increased serum Chromogranin A (CgA) levels. The increased CgA levels may cause false positive results in diagnostic investigations for neuroendocrine tumors [see Warnings and Precautions (5.16), Drug Interactions (7)]. Enterochromaffin-like (ECL) Cell EffectsHuman gastric biopsy specimens have been obtained from more than 3000 patients treated with omeprazole in long-term clinical trials. The incidence of ECL cell hyperplasia in these studies increased with time; however, no case of ECL cell carcinoids, dysplasia, or neoplasia has been found in these patients. However, these studies are of insufficient duration and size to rule out the possible influence of long-term administration of omeprazole on the development of any premalignant or malignant conditions. Endocrine EffectsOmeprazole given in oral doses of 30 or 40 mg for 2 to 4 weeks had no effect on thyroid function, carbohydrate metabolism, circulating levels of parathyroid hormone, cortisol, estradiol, testosterone, prolactin, cholecystokinin or secretin. Effects on Gastrointestinal Microbial EcologyAs do other agents that elevate intragastric pH, omeprazole administered for 14 days in healthy subjects produced a significant increase in the intragastric concentrations of viable bacteria. The pattern of the bacterial species was unchanged from that commonly found in saliva. All changes resolved within three days of stopping treatment. Other EffectsSystemic effects of omeprazole in the CNS, cardiovascular and respiratory systems have not been found to date.No effect on gastric emptying of the solid and liquid components of a test meal was demonstrated after a single dose of omeprazole 90 mg. In healthy subjects, a single intravenous dose of omeprazole (0.35 mg/kg) had no effect on intrinsic factor secretion. No systematic dose-dependent effect has been observed on basal or stimulated pepsin output in humans. However, when intragastric pH is maintained at 4.0 or above, basal pepsin output is low, and pepsin activity is decreased. Aspirin: Following absorption, aspirin (acetylsalicylic acid) is hydrolyzed to salicylic acid. The rate of absorption from the GI tract is dependent upon the presence or absence of food, gastric pH (the presence or absence of GI antacids or buffering agents), and other physiologic factors. Enteric coated aspirin products are erratically absorbed from the GI tract.Following single dose administration of YOSPRALA, peak concentrations of acetylsalicylic acid were reached at 2.5 hours for YOSPRALA 81 mg/40 mg tablets and at 4 to 4.5 hours for YOSPRALA 325 mg/40 mg tablets. The Cmax and AUC of acetylsalicylic acid were 2.6 mcg/mL and 3 mcg.hr/mL following single dose administration of YOSPRALA 81 mg/40 mg tablets and were 2.5 mcg/mL and 2.9 mcg.hr/mL following single dose administration of YOSPRALA 325 mg/40 mg tablets. There is no significant accumulation of salicylic acid and acetylsalicylic acid following 7 days dosing of YOSPRALA 325 mg/40 mg tablets compared to the first day of dosing.The inter-subject variability (CV%) of acetylsalicylic acid pharmacokinetic parameters ranged from 17% to 96%. Omeprazole: Following administration of YOSPRALA, the peak plasma concentration of omeprazole is reached at 0.5 hours on both the first day of administration and at steady state. The Cmax and AUC of omeprazole ranged from 617 to 856 ng/mL and 880-1384 ng.hr/mL following single dose administration of YOSPRALA 325 mg/40 mg tablets. Dosing YOSPRALA 325 mg/40 mg for 7 days results in approximately 2.3-fold higher AUC and 2-fold higher Cmax of omeprazole at steady state compared to the first day of dosing.The inter-subject variability of omeprazole pharmacokinetic parameters were high with % CVs ranging from 33% to 136%. Aspirin: Administration of YOSPRALA with high-fat (approximately 50%) and high-calorie (800-1000 calorie) meal in healthy subjects does not affect the extent of absorption of aspirin as measured by salicylic acid AUC and Cmax but significantly prolongs salicylic acid tmax by about 10 hours. Administration of YOSPRALA 60 minutes before a high-fat, high-calorie meal has essentially no effect on salicylic acid AUCs, Cmax and tmax. Omeprazole: Administration of YOSPRALA with high-fat (approximately 50%) and high-calorie (800-1000 calories) meal in healthy subjects significantly reduces the extent of absorption of omeprazole resulting in 67% and 84% reductions of AUCs and Cmax respectively relative to fasting conditions. Administration of YOSPRALA 60 minutes before high-fat, high-calorie meal reduced both the omeprazole AUC and Cmax by approximately 15% relative to fasting conditions [see Dosage and Administration (2.2)]. Aspirin: Salicylic acid is widely distributed to all tissues and fluids in the body including the central nervous system (CNS), breast milk, and fetal tissues. The highest concentrations are found in the plasma, liver, renal cortex, heart, and lungs. The protein binding of salicylate is concentration-dependent, i.e., nonlinear. At low concentrations (less than 100 mcg/mL), approximately 90% of plasma salicylate is bound to albumin while at higher concentrations (greater than 400 mcg/mL), only about 75% is bound. Omeprazole: Protein binding is approximately 95%. Aspirin: Aspirin (acetylsalicylic acid) is rapidly hydrolyzed in the plasma to salicylic acid such that plasma levels of aspirin are essentially undetectable 1 to 2 hours after dosing with half-life of 0.35 hrs. 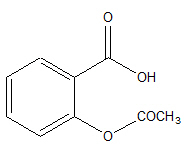 Salicylic acid is primarily conjugated in the liver to form salicyluric acid, a phenolic glucuronide, an acyl glucuronide, and a number of minor metabolites. Salicylate metabolism is saturable and total body clearance decreases at higher serum concentrations due to the limited ability of the liver to form both salicyluric acid and phenolic glucuronide. Omeprazole: Omeprazole is extensively metabolized by the cytochrome P450 (CYP) enzyme system. The major part of its metabolism is dependent on the polymorphically expressed CYP2C19, responsible for the formation of hydroxyomeprazole, the major metabolite in plasma. The remaining part is dependent on another specific isoform, CYP3A4, responsible for the formation of omeprazole sulphone. Aspirin: The elimination of salicylic acid follows zero order pharmacokinetics; (i.e., the rate of drug elimination is constant in relation to plasma concentration). Renal excretion of unchanged drug depends upon urine pH. As urinary pH rises above 6.5, the renal clearance of free salicylate increases from 5% to greater than 80%. Following therapeutic doses, approximately 10% is excreted in the urine as salicylic acid, 75% as salicyluric acid, and 10% phenolic and 5% acyl glucuronides of salicylic acid. Half-life of salicylic acid following YOSPRALA 325 mg/40 mg tablets is 2.4 hours. Omeprazole: Following single dose oral administration of a buffered solution of omeprazole, little if any unchanged drug was excreted in urine. The majority of the dose (about 77%) was eliminated in urine as at least six metabolites. Two were identified as hydroxyomeprazole and the corresponding carboxylic acid. The remainder of the dose was recoverable in feces. This implies a significant biliary excretion of the metabolites of omeprazole. Three metabolites have been identified in plasma — the sulfide and sulfone derivatives of omeprazole, and hydroxyomeprazole. These metabolites have very little or no antisecretory activity. The half-life of the omeprazole component is 1 hour. Age: Geriatric PopulationThere is no specific data on the pharmacokinetics of YOSPRALA in patients over age 65. Omeprazole: The elimination rate of omeprazole was somewhat decreased in the elderly, and bioavailability was increased. Omeprazole was 76% bioavailable when a single 40 mg oral dose of omeprazole (buffered solution) was administered to healthy elderly subjects, versus 58% in young subjects given the same dose. Nearly 70% of the dose was recovered in urine as metabolites of omeprazole and no unchanged drug was detected. The plasma clearance of omeprazole was 250 mL/min (about half that of young subjects) and its plasma half-life averaged one hour, about twice that of young healthy subjects. RacePharmacokinetic differences of YOSPRALA due to race have not been studied. Renal ImpairmentThe pharmacokinetics of YOSPRALA has not been determined in subjects with renal impairment. Omeprazole: In patients with chronic renal impairment, whose creatinine clearance ranged between 10 and 62 mL/min/1.73 m2, the disposition of omeprazole was very similar to that in healthy subjects, although there was a slight increase in bioavailability. Because urinary excretion is a primary route of excretion of omeprazole metabolites, their elimination slowed in proportion to the decreased creatinine clearance. Hepatic ImpairmentThe pharmacokinetics of YOSPRALA has not been determined in subjects with hepatic impairment. Omeprazole: In patients with chronic hepatic disease, classified as Child-Pugh Class A (n=3), B (n=4) and C (n=1), the bioavailability of omeprazole increased by approximately 100% compared to healthy subjects, reflecting decreased first-pass effect, and the plasma half-life of the drug increased to nearly 3 hours compared with the half-life in healthy subjects of 0.5 to 1 hour. Plasma clearance averaged 70 mL/min, compared with a value of 500 to 600 mL/min in healthy subjects [see Use in Specific Populations (8.7)]. Effect of YOSPRALA on Other DrugsOmeprazole is a time-dependent inhibitor of CYP2C19 and can increase the systemic exposure of co-administered drugs that are CYP2C19 substrates. In addition, administration of omeprazole increases intragastric pH and can alter the systemic exposure of certain drugs that exhibit pH-dependent solubility. Antiretrovirals: For some antiretroviral drugs, such as rilpivirine, atazanavir and nelfinavir, decreased serum concentrations have been reported when given together with omeprazole [see Drug Interactions (7)]. Rilpivirine: Following multiple doses of rilpivirine (150 mg, daily) and omeprazole (20 mg, daily), AUC was decreased by 40%, Cmax by 40%, and Cmin by 33% for rilpivirine. Nelfinavir: Following multiple doses of nelfinavir (1250 mg, twice daily) and omeprazole (40 mg daily), AUC was decreased by 36% and 92%, Cmax by 37% and 89% and Cmin by 39% and 75% respectively for nelfinavir and M8. Atazanavir: Following multiple doses of atazanavir (400 mg, daily) and omeprazole (40 mg, daily, 2 hours before atazanavir), AUC was decreased by 94%, Cmax by 96%, and Cmin by 95%. Saquinavir: Following multiple dosing of saquinavir/ritonavir (1000/100 mg) twice daily for 15 days with omeprazole 40 mg daily co-administered days 11 to 15.AUC was increased by 82%, Cmax by 75%, and Cmin by 106%. The mechanism behind this interaction is not fully elucidated. Therefore, clinical and laboratory monitoring for saquinavir toxicity is recommended during concurrent use with omeprazole. Clopidogrel: In a crossover clinical study, 72 healthy subjects were administered clopidogrel (300 mg loading dose followed by 75 mg per day) alone and with omeprazole (80 mg at the same time as clopidogrel) for 5 days. The exposure to the active metabolite of clopidogrel was decreased by 46% (Day 1) and 42% (Day 5) when clopidogrel and omeprazole were administered together.Results from another crossover study in healthy subjects showed a similar pharmacokinetic interaction between clopidogrel (300 mg loading dose/75 mg daily maintenance dose) and omeprazole 80 mg daily when co-administered for 30 days. Exposure to the active metabolite of clopidogrel was reduced by 41% to 46% over this time period.In another study, 72 healthy subjects were given the same doses of clopidogrel and 80 mg omeprazole but the drugs were administered 12 hours apart; the results were similar, indicating that administering clopidogrel and omeprazole at different times does not prevent their interaction [see Warnings and Precautions (5.4), Drug Interactions (7)]. Mycophenolate Mofetil: Administration of omeprazole 20 mg twice daily for 4 days and a single 1000 mg dose of MMF approximately one hour after the last dose of omeprazole to 12 healthy subjects in a cross-over study resulted in a 52% reduction in the Cmax and 23% reduction in the AUC of MPA [see Drug Interactions (7)]. Cilostazol: Omeprazole acts as an inhibitor of CYP2C19. Omeprazole, given in doses of 40 mg daily for one week to 20 healthy subjects in cross-over study, increased Cmax and AUC of cilostazol by 18% and 26% respectively. The Cmax and AUC of one of the active metabolites, 3,4-dihydro-cilostazol, which has 4-7 times the activity of cilostazol, were increased by 29% and 69%, respectively. Co-administration of cilostazol with omeprazole is expected to increase concentrations of cilostazol and the above mentioned active metabolite [see Drug Interactions (7)]. Diazepam: Concomitant administration of omeprazole 20 mg once daily and diazepam 0.1 mg/kg given intravenously resulted in 27% decrease in clearance and 36% increase in diazepam half-life [see Drug Interactions (7)]. Digoxin: Concomitant administration of omeprazole 20 mg once daily and digoxin in healthy subjects increased the bioavailability of digoxin by 10% (30% in two subjects) [see Drug Interactions (7)]. Voriconazole: Concomitant administration of omeprazole and voriconazole (a combined inhibitor of CYP2C19 and CYP3A4) resulted in more than doubling of the omeprazole exposure. When voriconazole (400 mg every 12 hours for one day, followed by 200 mg once daily for 6 days) was given with omeprazole (40 mg once daily for 7 days) to healthy subjects, the steady-state Cmax and AUC0-24 of omeprazole significantly increased: an average of 2 times (90% CI: 1.8, 2.6) and 4 times (90% CI: 3.3, 4.4), respectively, as compared to when omeprazole was given without voriconazole [see Drug Interactions (7)]. AspirinAdministration of aspirin for 68 weeks at 0.5% in the feed of rats was not carcinogenic.In the Ames Salmonella assay, aspirin was not mutagenic; however, aspirin did induce chromosome aberrations in cultured human fibroblasts.Aspirin inhibits ovulation in rats. OmeprazoleIn two 24-month carcinogenicity studies in rats, omeprazole at daily doses of 1.7, 3.4, 13.8, 44.0 and 140.8 mg/kg/day (about 0.35 to 34 times the human dose of 40 mg per day, based on body surface area) produced gastric ECL cell carcinoids in a dose-related manner in both male and female rats; the incidence of this effect was markedly higher in female rats, which had higher blood levels of omeprazole. Gastric carcinoids seldom occur in the untreated rat. In addition, ECL cell hyperplasia was present in all treated groups of both sexes. In one of these studies, female rats were treated with 13.8 mg omeprazole/kg/day (about 3.4 times the human dose of 40 mg per day, based on body surface area) for one year, then followed for an additional year without the drug. No carcinoids were seen in these rats. An increased incidence of treatment-related ECL cell hyperplasia was observed at the end of one year (94% treated vs 10% controls). By the second year the difference between treated and control rats was much smaller (46% vs 26%) but still showed more hyperplasia in the treated group. Gastric adenocarcinoma was seen in one rat (2%). No similar tumor was seen in male or female rats treated for two years. For this strain of rat no similar tumor has been noted historically, but a finding involving only one tumor is difficult to interpret. In a 52-week toxicity study in Sprague-Dawley rats, brain astrocytomas were found in a small number of males that received omeprazole at dose levels of 0.4, 2, and 16 mg/kg/day (about 0.1 to 3.2 times the human dose of 40 mg/day, based on body surface area). No astrocytomas were observed in female rats in this study. In a 2-year carcinogenicity study in Sprague-Dawley rats, no astrocytomas were found in males and females at the high dose of 140.8 mg/kg/day (about 34 times the human dose of 40 mg per day, based on body surface area). A 78-week mouse carcinogenicity study of omeprazole did not show increased tumor occurrence, but the study was not conclusive. A 26-week p53 (+/-) transgenic mouse carcinogenicity study was not positive.Omeprazole was positive for clastogenic effects in an in vitro human lymphocyte chromosomal aberration assay, in one of two in vivo mouse micronucleus tests, and in an in vivo bone marrow cell chromosomal aberration assay. Omeprazole was negative in the in vitro Ames Salmonella typhimurium assay, an in vitro mouse lymphoma cell forward mutation assay and an in vivo rat liver DNA damage assay.Omeprazole at oral doses up to 138 mg/kg/day (about 34 times the human dose of 40 mg per day, based on body surface area) was found to have no effect on fertility and reproductive performance.In 24-month carcinogenicity studies in rats, a dose-related significant increase in gastric carcinoid tumors and ECL cell hyperplasia was observed in both male and female animals. Carcinoid tumors have also been observed in rats subjected to fundectomy or long-term treatment with other proton pump inhibitors or high doses of H2-receptor antagonists. AspirinThe acute oral 50% lethal dose in rats is about 1.5 g/kg and in mice 1.1 g/kg. Renal papillary necrosis and decreased urinary concentrating ability occur in rodents chronically administered high doses. Dose-dependent gastric mucosal injury occurs in rats and humans. Mammals may develop aspirin toxicosis associated with GI symptoms, circulatory effects, and central nervous system depression [see Overdosage (10)]. Reproductive Toxicology StudiesReproductive studies conducted with omeprazole in rats at oral doses up to 138 mg/kg/day (about 34 times the human dose on a body surface area basis) and in rabbits at doses up to 69 mg/kg/day (about 34 times the human dose on a body surface area basis) did not disclose any evidence for a teratogenic potential of omeprazole. In rabbits, omeprazole in a dose range of 6.9 to 69.1 mg/kg/day (about 3.4 to 34 times the human dose on a body surface area basis) produced dose-related increases in embryo-lethality, fetal resorptions, and pregnancy disruptions. In rats, dose-related embryo/fetal toxicity and postnatal developmental toxicity were observed in offspring resulting from parents treated with omeprazole at 13.8 to 138.0 mg/kg/day (about 3.4 to 34 times the human doses on a body surface area basis). Juvenile Animal StudyA 28-day toxicity study with a 14-day recovery phase was conducted in juvenile rats with esomeprazole magnesium at oral doses of 70 to 280 mg/kg/day (about 17 to 67 times a daily oral human dose of 40 mg on a body surface area basis). An increase in the number of deaths at the high dose of 280 mg/kg/day was observed when juvenile rats were administered esomeprazole magnesium from postnatal day 7 through postnatal day 35. In addition, doses equal to or greater than 140 mg/kg/day (about 34 times a daily oral human dose of 40 mg on a body surface area basis), produced treatment-related decreases in body weight (approximately 14%) and body weight gain, decreases in femur weight and femur length, and affected overall growth. Comparable findings described above have also been observed in this study with another esomeprazole salt, esomeprazole strontium, at equimolar doses of esomeprazole. Ischemic Stroke and Transient Ischemic Attack (TIA)In clinical trials of subjects with TIA due to fibrin platelet emboli or ischemic stroke, aspirin has been shown to significantly reduce the risk of the combined endpoint of stroke or death and the combined endpoint of TIA, stroke, or death by about 13 to18%. Prevention of Recurrent MI and Unstable Angina PectorisThese indications are supported by the results of six large, randomized, multi-center, placebo-controlled trials of predominantly male post-MI subjects and one randomized placebo-controlled study of men with unstable angina pectoris. Aspirin therapy in MI subjects was associated with a significant reduction (about 20%) in the risk of the combined endpoint of subsequent death and/or nonfatal reinfarction in these patients. In aspirin-treated unstable angina patients the event rate was reduced to 5% from the 10% rate in the placebo group. Chronic Stable Angina PectorisIn a randomized, multi-center, double-blind trial designed to assess the role of aspirin for prevention of MI in patients with chronic stable angina pectoris, aspirin significantly reduced the primary combined endpoint of nonfatal MI, fatal MI, and sudden death by 34%. The secondary endpoint for vascular events (first occurrence of MI, stroke, or vascular death) was also significantly reduced (32%). Revascularization ProceduresMost patients who undergo coronary artery revascularization procedures have already had symptomatic coronary artery disease for which aspirin is indicated. Similarly, patients with lesions of the carotid bifurcation sufficient to require carotid endarterectomy are likely to have had a precedent event. Aspirin is recommended for patients who undergo revascularization procedures if there is a preexisting condition for which aspirin is already indicated. YOSPRALA trialsTwo randomized, multi-center, double-blind trials (Study 1 and Study 2) evaluated the omeprazole component by comparing the incidence of gastric ulcer formation in 524 patients randomized to YOSPRALA 325 mg/40 mg tablets and 525 patients randomized to EC-aspirin 325 mg. Patients were included with a cerebro- or cardiovascular diagnosis if they had been taking daily aspirin 325 mg for at least 3 months, were expected to require daily aspirin 325 mg therapy for at least 6 months and were over 55 years old. Subjects between 18 and 55 years old were also required to have a documented history of gastric or duodenal ulcer within the past 5 years. The majority of patients were male (71%) and white (90%). The majority (57%) of patients were ≥65 years of age. Approximately 11% were also on chronic NSAID therapy.Studies 1 and 2 showed that YOSPRALA given as 325 mg/40 mg tablets once daily statistically significantly reduced the 6-month cumulative incidence of gastric ulcers compared to EC-aspirin 325 mg once daily. The results at one month, three months, and six months treatment are presented in Table 4.Table 4: Cumulative Incidence of Gastric Ulcers at 1, 3, and 6 MonthsStudy 1Study 2YOSPRALAN=265Number(%)EC-AspirinN=265Number(%)YOSPRALAN=259Number(%)EC-AspirinN=260Number(%)0-1 Month3 (1.1)10 (3.8)1 (0.4)8 (3.1)0-3 Months8 (3.0)18 (6.8)1 (0.4)17 (6.5)0-6 MonthsStudy 1: p=0.020 and Study 2: p=0.005 for treatment comparisons of cumulative GU incidence at 6 months.10 (3.8)23 (8.7)7 (2.7)22 (8.5)In both trials, patients receiving YOSPRALA 325 mg/40 mg tablets had a statistically significantly lower 6-month cumulative incidence of gastric and/or duodenal ulcers compared to EC-aspirin 325 mg (3% vs. 12%).Upper GI bleeding was reported as a serious adverse reaction in each treatment arm; 1 gastric ulcer hemorrhage in a subject receiving YOSPRALA and 1 duodenal ulcer hemorrhage in a subject receiving EC-aspirin alone. Coagulation AbnormalitiesAdvise patients to inform their health care provider if they experience any unanticipated, prolonged or excessive bleeding or bleeding time (e.g. bruising, nose bleed) [see Warnings and Precautions (5.1)]. GI Adverse ReactionsAdvise patients to stop taking YOSPRALA and call their health care provider right away if they have any of the following signs or symptoms: 1) black, bloody, or tarry stools; 2) coughing up blood or vomit that looks like coffee grounds; 3) severe nausea, vomiting, or stomach pain [see Warnings and Precautions (5.2)]. Bleeding Risk with Use of AlcoholAdvise patients to avoid heavy alcohol use (three or more drinks every day) during treatment with YOSPRALA during treatment with YOSPRALA [see Warnings and Precautions (5.3)]. Drug InteractionsAdvise patients to report to their healthcare provider before starting treatment with any of the following:Rilpivirine-containing products [see Contraindications (4)]. Clopidogrel, ticagrelor, St. John's Wort or rifampin; or, if they take high-dose methotrexate [see Warnings and Precautions (5.4, 5.5, 5.15, 5.17)]. Renal FailureAdvise patients to report to their health care provider if they develop kidney problems (e.g. changes in urination, swelling, skin rash/itching, ammonia breath) [see Warnings and Precautions (5.6)]. Gastric MalignancyAdvise patients to return to their healthcare provider if they have gastric symptoms while taking YOSPRALA or after completing treatment [see Warnings and Precautions (5.7)]. Acute Interstitial NephritisAdvise patients to call their healthcare provider immediately if they experience signs and/or symptoms associated with acute interstitial nephritis [see Warnings and Precautions (5.8)]. Clostridium difficile-Associated DiarrheaAdvise patients to call their health care provider immediately if they experience diarrhea that does not improve [see Warnings and Precautions (5.9)]. Bone FractureAdvise patients to report any fractures, especially of the hip, wrist or spine, to their health care provider [see Warnings and Precautions (5.10)]. Cutaneous and Systemic Lupus ErythematosusAdvise patients to immediately call their health care provider for any new or worsening of symptoms associated with cutaneous or systemic lupus erythematosus [see Warnings and Precautions (5.11)]. Hepatic ImpairmentAdvise patients to report to their health care provider if they develop liver problems (e.g. skin and eyes that appear yellowish, abdominal pain and swelling, itchy skin, dark urine color) [see Warnings and Precautions (5.12)]. Cyanocobalamin (Vitamin B-12) DeficiencyAdvise patients to report any clinical symptoms that may be associated with cyanocobalamin deficiency to their health care provider if they have been receiving YOSPRALA for longer than 3 years [see Warnings and Precautions (5.13)]. HypomagnesemiaAdvise patients to report any clinical symptoms that may be associated with hypomagnesemia to their health care provider, if they have been receiving YOSPRALA for at least 3 months [see Warnings and Precautions (5.14)]. Fetal ToxicityInform pregnant women to avoid use of YOSPRALA and other NSAIDs starting at 30 weeks gestation because of the risk of the premature closure of the fetal ductus arteriosus [see Warnings and Precautions (5.18) and Use in Specific Populations (8.1)]. LactationAdvise women that breastfeeding is not recommended during treatment with YOSPRALA [see Use in Specific Populations (8.2)]. InfertilityAdvise females of reproductive potential that NSAIDs, including YOSPRALA, may be associated with reversible infertility [see Use in Specific Populations (8.3)]. Administration [see Dosage and Administration (2.2)]Advise patients:To take YOSPRALA once daily at least 60 minutes before a meal.The tablets are to be swallowed whole with liquid. Do not split, chew, crush or dissolve the tablet.If a dose is missed, administer as soon as possible. However, if the next scheduled dose is due, do not take the missed dose, and take the next dose on time. Do not take two doses at one time to make up for a missed dose, unless advised by their health care provider.Not to stop taking YOSPRALA suddenly as this could increase the risk of heart attack or stroke. Take one tablet daily.YOSPRALA is available in combinations that contain 81 mg or 325 mg of aspirin. Generally 81 mg of aspirin has been accepted as an effective dose for secondary cardiovascular prevention. Providers should consider the need for 325 mg and refer to current clinical practice guidelines. Take YOSPRALA once daily at least 60 minutes before a meal.The tablets are to be swallowed whole with liquid. Do not split, chew, crush or dissolve the tablet.Use the lowest effective dose of YOSPRALA based on the individual patient's treatment goals and to avoid potential dose dependent adverse reactions including bleeding.If a dose of YOSPRALA is missed, advise patients to take it as soon as it is remembered. If it is almost time for the next dose, skip the missed dose. Take the next dose at the regular time. Patients should not take 2 doses at the same time unless advised by their doctor.Do not stop taking YOSPRALA suddenly as this could increase the risk of heart attack or stroke. Oval, blue-green, film-coated, delayed-release tablets for oral administration containing either:81 mg delayed-release aspirin and 40 mg immediate-release omeprazole, printed with 81/40, or325 mg delayed-release aspirin and 40 mg immediate-release omeprazole, printed with 325/40. YOSPRALA is contraindicated in:Patients with known allergy to aspirin and other nonsteroidal anti-inflammatory drug products (NSAIDs) and in patients with the syndrome of asthma, rhinitis, and nasal polyps. Aspirin may cause severe urticaria, angioedema, or bronchospasm (asthma).Pediatric patients with suspected viral infections, with or without fever, because of the risk of Reye's syndrome with concomitant use of aspirin in certain viral illnesses.YOSPRALA is contraindicated in patients with known hypersensitivity to aspirin, omeprazole, substituted benzimidazoles, or to any of the excipients in the formulation [see Warnings and Precautions (5.8), Adverse Reactions (6.2)].Proton pump inhibitor (PPI)–containing products, including YOSPRALA, are contraindicated in patients receiving rilpivirine-containing products [see Drug Interactions (7)]. Aspirin is associated with serious gastrointestinal (GI) adverse reactions, including inflammation, bleeding ulceration and perforation of the upper and lower GI tract. Other adverse reactions with aspirin include stomach pain, heartburn, nausea, and vomiting.Serious GI adverse reactions reported in the clinical trials of YOSPRALA were: gastric ulcer hemorrhage in one of the 521 patients treated with YOSPRALA and duodenal ulcer hemorrhage in one of the 524 patients treated with enteric-coated aspirin. In addition, there were two cases of intestinal hemorrhage, one in each treatment group, and one patient treated with YOSPRALA experienced obstruction of the small bowel.Although minor upper GI symptoms, such as dyspepsia, are common and can occur anytime during therapy, monitor patients for signs of ulceration and bleeding, even in the absence of previous GI symptoms. Inform patients about the signs and symptoms of GI adverse reactions.If active and clinically significant bleeding from any source occurs in patients receiving YOSPRALA, discontinue treatment. Avoid concomitant use of YOSPRALA with clopidogrel. Clopidogrel is a prodrug. Inhibition of platelet aggregation by clopidogrel is entirely due to an active metabolite. The metabolism of clopidogrel to its active metabolite can be impaired by use with concomitant medications, such as omeprazole, that interfere with CYP2C19 activity. Co-administration of clopidogrel with 80 mg omeprazole reduces the pharmacological activity of clopidogrel, even when administered 12 hours apart. When using YOSPRALA, consider alternative anti-platelet therapy [see Drug Interactions (7), Clinical Pharmacology (12.3)]. Maintenance doses of aspirin above 100 mg reduce the effectiveness of ticagrelor in preventing thrombotic cardiovascular events. Avoid concomitant use of ticagrelor with the 325 mg/40 mg tablet strength of YOSPRALA [see Drug Interactions (7)]. Avoid YOSPRALA in patients with severe renal failure (glomerular filtration rate less than 10 mL/minute). Regular use of aspirin is associated in a dose-dependent manner with an increased risk of chronic renal failure. Aspirin use decreases glomerular filtration rate and renal blood flow especially with patients with pre-existing renal disease. [see Use in Specific Populations (8.6), Clinical Pharmacology (12.3)]. Acute interstitial nephritis has been observed in patients taking PPIs including omeprazole. Acute interstitial nephritis may occur at any point during PPI therapy and is generally attributed to an idiopathic hypersensitivity reaction. Discontinue YOSPRALA if acute interstitial nephritis develops [see Contraindications (4)]. Published observational studies suggest that PPI-containing therapy like YOSPRALA may be associated with an increased risk of Clostridium difficile-associated diarrhea (CDAD), especially in hospitalized patients. This diagnosis should be considered for diarrhea that does not improve [see Adverse Reactions (6.2)].Use the lowest dose and shortest duration of YOSPRALA appropriate to the condition being treated. Several published observational studies suggest that PPI therapy may be associated with an increased risk for osteoporosis-related fractures of the hip, wrist, or spine. The risk of fracture was increased in patients who received high-dose, defined as multiple daily doses, and long-term PPI therapy (a year or longer). Use the lowest dose and shortest duration of YOSPRALA therapy appropriate to the condition being treated. Manage patients at risk for osteoporosis-related fractures according to established treatment guidelines [see Adverse Reactions (6.2)]. Cutaneous lupus erythematosus (CLE) and systemic lupus erythematosus (SLE) have been reported in patients taking PPIs, including omeprazole. These events have occurred as both new onset and an exacerbation of existing autoimmune disease. The majority of PPI-induced lupus erythematous cases were CLE.The most common form of CLE reported in patients treated with PPIs was subacute CLE (SCLE), and occurred within weeks to years after continuous drug therapy in patients ranging from infants to the elderly.Generally, histological findings were observed without organ involvement.Systemic lupus erythematosus (SLE) is less commonly reported than CLE in patients receiving PPIs. PPI associated SLE is usually milder than non-drug induced SLE. Onset of SLE typically occurred within days to years after initiating treatment, but some cases occurred days or years after initiating treatment. SLE occurred primarily in patients ranging from young adults to the elderly. The majority of patients presented with rash; however, arthralgia and cytopenia were also reported.Avoid administration of PPIs for longer than medically indicated. If signs or symptoms consistent with CLE or SLE are noted in patients receiving YOSPRALA, discontinue the drug and refer the patient to the appropriate specialist for evaluation. Most patients improve with discontinuation of the PPI alone in 4 to 12 weeks. Serologicial testing (e.g., ANA) may be positive and elevated serologicial test results may take longer to resolve than clinical manifestations. Long-term moderate to high doses of aspirin may result in elevations in serum ALT levels. These abnormalities resolve rapidly with discontinuation of aspirin. The hepatotoxicity of aspirin is usually mild and asymptomatic. Bilirubin elevations are usually mild or absent. Systemic exposure to omeprazole is increased in patients with hepatic impairment [see Clinical Pharmacology (12.3)]. Avoid YOSPRALA in patients with any degree of hepatic impairment [see Use in Specific Populations (8.7)]. Daily treatment with any acid-suppressing medications over a long period of time (e.g., longer than 3 years) may lead to malabsorption of cyanocobalamin (vitamin B-12) caused by hypo- or achlorhydria. Rare reports of cyanocobalamin deficiency occurring with acid-suppressing therapy have been reported in the literature. This diagnosis should be considered if clinical symptoms consistent with cyanocobalamin deficiency are observed in patients treated with YOSPRALA. Hypomagnesemia, symptomatic and asymptomatic, has been reported rarely in patients treated with PPIs for at least three months, in most cases after a year of therapy. Serious adverse events include tetany, arrhythmias, and seizures. In most patients, treatment of hypomagnesemia required magnesium replacement and discontinuation of the PPI. For patients expected to be on prolonged treatment or who take YOSPRALA with medications such as digoxin or drugs that may cause hypomagnesemia (e.g., diuretics), consider monitoring magnesium levels prior to initiation of YOSPRALA and periodically during treatment [see Adverse Reactions (6.2)]. Drugs which induce the CYP2C19 or CYP3A4 (such as St. John's Wort or rifampin) can substantially decrease concentrations of omeprazole. Avoid concomitant use of YOSPRALA with St. John's Wort or rifampin [see Drug Interactions (7)]. Serum chromogranin A (CgA) levels increase secondary to omeprazole-induced decreases in gastric acidity. The increased CgA level may cause false positive results in diagnostic interventions for neuroendocrine tumors. Temporarily discontinue treatment with YOSPRALA at least 14 days before assessing CgA levels and consider repeating the test if initial CgA levels are high. If serial tests are performed (e.g., for monitoring), the same commercial laboratory should be used for testing, as reference ranges between tests may vary [see Drug Interactions (7) and Clinical Pharmacology (12.2)]. Literature suggests that concomitant use of PPIs with methotrexate (primarily at high dose) may elevate and prolong serum levels of methotrexate and/or its metabolite, possibly leading to methotrexate toxicities. In high-dose methotrexate administration, a temporary withdrawal of YOSPRALA may be considered in some patients [see Drug Interactions (7)]. NSAIDs including aspirin, may cause premature closure of the fetal ductus arteriosus. Avoid use of NSAIDs, including YOSPRALA, in pregnant women starting at 30 weeks of gestation (third trimester). [see Use in Specific Populations (8.1)]. Because clinical trials are conducted under widely varying conditions, adverse reaction rates observed in the clinical trials of a drug cannot be directly compared to rates in the clinical trials of another drug and may not reflect the rates observed in practice.YOSPRALA 325 mg/40 mg was studied primarily in two randomized, double-blind controlled clinical trials (n=524) of 6 months duration. Table 1 lists adverse reactions that occurred in >2% of patients in the YOSPRALA arm and were more common than in the control arm, consisting of 325 mg of enteric coated (EC)-aspirin.Table 1: Most Common Adverse Reactions in Study 1 and Study 2Adverse reactions occurring in ≥2% of YOSPRALA-treated patients and more common than in the control armPreferred TermYOSPRALA325 mg/40 mg once daily(n=521)%EC-Aspirin325 mg once daily(n=524)%Gastritis1816Nausea32Diarrhea32Gastric polyps21Non-cardiac chest pain21In Study 1 and Study 2 combined, 7% of patients taking YOSPRALA discontinued due to adverse reactions compared to 11% of patients taking EC-aspirin alone. The most common reasons for discontinuations due to adverse reactions in the YOSPRALA treatment group were upper abdominal pain (<1%, n=2), diarrhea (<1%, n=2) and dyspepsia (<1%, n=2). Tables 2 and 3 include drugs with clinically important drug interactions and interaction with diagnostics when administered concomitantly with YOSPRALA and instructions for preventing or managing them.Consult the labeling of concomitantly used drugs to obtain further information about interactions with omeprazole or aspirin.Table 2: Clinically Relevant Interactions Affecting Drugs Co-Administered with YOSPRALA and Interaction with DiagnosticsAntiretroviralsClinical Impact:The effect of PPIs, such as omeprazole, on antiretroviral drugs is variable. The clinical importance and the mechanisms behind these interactions are not always known.Decreased exposure of some antiretroviral drugs (e.g., rilpivirine, atazanavir and nelfinavir) when used concomitantly with omeprazole may reduce antiviral effect and promote the development of drug resistance [see Clinical Pharmacology (12.3)].Increased exposure of other antiretroviral drugs (e.g., saquinavir) when used concomitantly with omeprazole may increase toxicity [see Clinical Pharmacology (12.3)].There are other antiretroviral drugs which do not result in clinically relevant interactions with omeprazole.Intervention:Rilpivirine-containing products: Concomitant use with YOSPRALA is contraindicated [see Contraindications (4)].Atazanavir: Avoid concomitant use with YOSPRALA. See prescribing information for atazanavir for dosing information.Nelfinavir: Avoid concomitant use with YOSPRALA. See prescribing information for nelfinavir.Saquinavir: See the prescribing information for saquinavir for monitoring of potential saquinavir-related toxicities.Other antiretrovirals: See prescribing information for specific antiretroviral drugs.Heparin and WarfarinClinical Impact:Increased INR and prothrombin time in patients receiving PPIs, including omeprazole, and warfarin concomitantly. Increases in INR and prothrombin time may lead to abnormal bleeding and even death.Aspirin can increase the anticoagulant activity of heparin and warfarin, increasing bleeding risk.Intervention:Monitor INR and prothrombin time and adjust the dose of warfarin, if needed, to maintain target INR range.Monitor and adjust the dose of heparin and warfarin as needed.MethotrexateClinical Impact:Concomitant use of omeprazole with methotrexate (primarily at high dose) may elevate and prolong serum concentrations of methotrexate and/or its metabolite hydroxymethotrexate, possibly leading to methotrexate toxicities. No formal drug interaction studies of high-dose methotrexate with PPIs, such as omeprazole, have been conducted [see Warnings and Precautions (5.17)].Intervention:A temporary withdrawal of YOSPRALA may be considered in some patients receiving high-dose methotrexate.CYP2C19 Substrates (e.g., clopidogrel, citalopram, cilostazol, phenytoin, diazepam)ClopidogrelClinical Impact:Concomitant use of omeprazole 80 mg results in reduced plasma concentrations of the active metabolite of clopidogrel and a reduction in platelet inhibition [see Clinical Pharmacology (12.3)].There are no adequate combination studies of a lower dose of omeprazole or a higher dose of clopidogrel in comparison with the approved dose of clopidogrel.Intervention:Avoid concomitant use with YOSPRALA. Consider use of alternative anti-platelet therapy [see Warnings and Precautions (5.4)].CitalopramClinical Impact:Concomitant use of omeprazole results in increased exposure of citalopram leading to an increased risk of QT prolongation [see Clinical Pharmacology (12.3)].Intervention:Limit the dose of citalopram to a maximum of 20 mg per day. See prescribing information for citalopram.CilostazolClinical Impact:Concomitant use of omeprazole results in increased exposure of one of the active metabolites of cilostazol (3,4-dihydro-cilostazol).Intervention:Reduce the dose of cilostazol to 50 mg twice daily. See prescribing information for cilostazol.PhenytoinClinical Impact:Potential for increased exposure of phenytoin with concomitant omeprazole. Aspirin can displace protein-bound phenytoin leading to a decrease in the total concentration of phenytoin.Intervention:Monitor phenytoin serum concentrations. Dose adjustment may be needed to maintain therapeutic drug concentrations. See prescribing information for phenytoin.DiazepamClinical Impact:Increased exposure of diazepam with concomitant omeprazole [see Clinical Pharmacology (12.3)].Intervention:Monitor patients for increased sedation and reduce the dose of diazepam as needed.TicagrelorClinical Impact:Maintenance doses of aspirin above 100 mg reduce the effectiveness of ticagrelor.Intervention:Avoid concomitant use of ticagrelor with the 325 mg/40 mg tablet strength of YOSPRALA [see Warnings and Precautions (5.5)].DigoxinClinical Impact:Potential for increased exposure of digoxin with concomitant omeprazole [see Clinical Pharmacology (12.3)].Intervention:Monitor digoxin concentrations. Dose adjustment may be needed to maintain therapeutic drug concentrations. See digoxin prescribing information.Drugs Dependent on Gastric pH for Absorption (e.g., iron salts, erlotinib, dasatinib, nilotinib, mycophenolate mofetil, ketoconazole/itraconazole)Clinical Impact:Omeprazole can reduce the absorption of other drugs due to its effect on reducing intragastric acidity.Intervention:Mycophenolate mofetil (MMF): Co-administration of omeprazole in healthy subjects and in transplant patients receiving MMF has been reported to reduce the exposure to the active metabolite, mycophenolic acid (MPA), possibly due to a decrease in MMF solubility at an increased gastric pH. The clinical relevance of reduced MPA exposure on organ rejection has not been established in transplant patients receiving omeprazole and MMF. Use Yosprala with caution in transplant patients receiving MMF [see Clinical Pharmacology (12.3)].See the prescribing information for other drugs dependent on gastric pH for absorption.TacrolimusClinical Impact:Potential for increased exposure of tacrolimus with concomitant omeprazole, especially in transplant patients who are intermediate or poor metabolizers of CYP2C19.Intervention:Monitor tacrolimus whole blood concentrations. Dose adjustment may be needed to maintain therapeutic drug concentrations. See prescribing information for tacrolimus.ACE-InhibitorsClinical Impact:Aspirin may diminish the antihypertensive effect of ACE-inhibitors.Intervention:Monitor blood pressure as needed.Beta BlockersClinical Impact:The hypotensive effects of beta blockers may be diminished by the concomitant administration of aspirin.Intervention:Monitor blood pressure as needed in patients taking YOSPRALA concomitantly with beta blockers for hypertension.DiureticsClinical Impact:The effectiveness of diuretics in patients with underlying renal or cardiovascular disease may be diminished by the concomitant administration of aspirin.Intervention:Monitor blood pressure as needed.NSAIDsClinical Impact:The concurrent use of NSAIDs and aspirin may increase the risk of serious adverse events, including increased bleeding or decreased renal function.Intervention:Monitor for signs and symptoms of bleeding or decreased renal function.Oral HypoglycemicsClinical Impact:Moderate doses of aspirin may increase the effectiveness of oral hypoglycemic drugs, leading to hypoglycemia.Intervention:Monitor blood sugar as needed.AcetazolamideClinical Impact:Concurrent use of aspirin and acetazolamide can lead to high serum concentrations of acetazolamide (and toxicity).Intervention:Adjust the dose of acetazolamide if signs of toxicity occur.Uricosuric Agents (Probenecid)Clinical Impact:Aspirin antagonizes the uricosuric action of uricosuric agents.Intervention:Monitor serum uric acid levels as needed.Valproic AcidClinical Impact:Concomitant use of aspirin can displace protein-bound valproic acid, leading to an increase in serum concentrations of valproic acid.Intervention:Monitor valproic acid serum concentrations. Dose adjustment may be needed to maintain therapeutic drug concentrations. See prescribing information for valproic acid.Interactions with Investigations of Neuroendocrine TumorsClinical Impact:Serum chromogranin A (CgA) levels increase secondary to omeprazole-induced decreases in gastric acidity. The increased CgA level may cause false positive results in diagnostic investigations for neuroendocrine tumors [see Warnings and Precautions (5.16), Clinical Pharmacology (12.2)].Intervention:Temporarily stop YOSPRALA treatment at least 14 days before assessing CgA levels and consider repeating the test if initial CgA levels are high. If serial tests are performed (e.g., for monitoring), the same commercial laboratory should be used for testing, as reference ranges between tests may vary.Interaction with Secretin Stimulation TestClinical Impact:Omeprazole can cause a hyper-response in gastrin secretion in response to secretin stimulation test, falsely suggesting gastrinoma.Intervention:Temporarily stop YOSPRALA treatment at least 14 days before assessing to allow gastrin levels to return to baseline [see Clinical Pharmacology (12.2)].False Positive Urine Tests for THCClinical Impact:There have been reports of false positive urine screening tests for tetrahydrocannabinol (THC) in patients receiving PPIs such as omeprazole.Intervention:An alternative confirmatory method should be considered to verify positive results.OtherClinical Impact:There have been clinical reports of interactions with other drugs metabolized via the cytochrome P450 system (e.g., cyclosporine, disulfiram) with omeprazole.Intervention:Monitor patients to determine if it is necessary to adjust the dosage of these other drugs when taken concomitantly with YOSPRALA.Table 3: Clinically Relevant Interactions Affecting YOSPRALA When Co- Administered with Other DrugsCYP2C19 or CYP3A4 InducersClinical Impact:Decreased exposure of omeprazole when used concomitantly with strong inducers [see Clinical Pharmacology (12.3)].Intervention:St. John's Wort, rifampin: Avoid concomitant use with YOSPRALA [see Warnings and Precautions (5.15)].Ritonavir-containing products: See prescribing information for specific drugs.CYP2C19 or CYP3A4 InhibitorsClinical Impact:Increased exposure of omeprazole [see Clinical Pharmacology (12.3)].Intervention:Voriconazole: Avoid concomitant use with YOSPRALA. The safety and efficacy of YOSPRALA has not been established in pediatric patients. YOSPRALA is contraindicated in pediatric patients with suspected viral infections, with or without fever, because of the risk of Reye's syndrome with concomitant use of aspirin in certain viral illnesses [see Contraindications (4)]. Of the total number of patients who received YOSPRALA (n=900) in clinical trials, 62% were ≥65 years of age and 15% were 75 years and over. No overall differences in safety or effectiveness were observed between these subjects and younger subjects and other reported clinical experience with aspirin and omeprazole has not identified differences in responses between the elderly and younger patients, but greater sensitivity of some older individuals cannot be ruled out [see Clinical Pharmacology (12.3)]. No dose reduction of YOSPRALA is necessary in patients with mild to moderate renal impairment. Avoid YOSPRALA in patients with severe renal impairment (glomerular filtration rate less than 10 mL/minute) due to the aspirin component [see Warnings and Precautions (5.6), Clinical Pharmacology (12.3)]. Long-term moderate to high doses of aspirin may result in elevations in serum ALT levels [see Warnings and Precautions (5.12)]. Systemic exposure to omeprazole is increased in patients with hepatic impairment [see Clinical Pharmacology (12.3)]. Avoid YOSPRALA in patients with any degree of hepatic impairment. In studies of healthy subjects, Asians had approximately a four-fold higher exposure to omeprazole than Caucasians. CYP2C19, a polymorphic enzyme, is involved in the metabolism of omeprazole. Approximately 15% to 20% of Asians are CYP2C19 poor metabolizers. Tests are available to identify a patient's CYP2C19 genotype. Avoid use in Asian patients with unknown CYP2C19 genotype or those who are known to be poor metabolizers [see Clinical Pharmacology (12.5)]. The active ingredients of YOSPRALA are aspirin which is an antiplatelet agent and omeprazole which is a PPI.YOSPRALA (aspirin and omeprazole) is an oval, blue-green, multi-layer film-coated, delayed-release tablet consists of an enteric coated delayed-release aspirin core surrounded by an immediate-release omeprazole layer for oral administration. Each delayed-release tablet contains either 81 mg aspirin and 40 mg omeprazole printed with 81/40, or 325 mg aspirin and 40 mg omeprazole printed with 325/40.The excipients used in the formulation of YOSPRALA are all inactive and United States Pharmacopeia/National Formulary (USP/NF) defined. The inactive ingredients in YOSPRALA include: carnauba wax, colloidal silicon dioxide, corn starch, FD&C Blue #2, glyceryl monostearate, hydroxypropyl methycellulose, methacrylic acid copolymer dispersion, microcrystalline cellulose, polydextrose, polyethylene glycol, polysorbate 80, povidone, pre-gelatinized starch, sodium phosphate dibasic anhydrous, stearic acid, talc, titanium dioxide, triacetin, triethyl citrate, yellow iron oxide.Aspirin is acetylsalicylic acid and is chemically known as benzoic acid, 2-(acetyloxy). Aspirin is an odorless white needle-like crystalline or powdery substance. When exposed to moisture, aspirin hydrolyzes into salicylic and acetic acids and gives off a vinegary odor. It is highly lipid soluble and slightly soluble in water. Aspirin irreversibly inhibits platelet COX-1.Omeprazole is a white to off-white crystalline powder which melts with decomposition at about 155°C. It is a weak base, freely soluble in ethanol and methanol, and slightly soluble in acetone and isopropanol and very slightly soluble in water. The stability of omeprazole is a function of pH; it is rapidly degraded in acid media, but has acceptable stability under alkaline conditions.Omeprazole is a substituted benzimidazole, 5-methoxy-2-[[(4-methoxy-3, 5-dimethyl-2-pyridinyl) methyl] sulfinyl]-1H- benzimidazole, a compound that inhibits gastric acid secretion. Aspirin (acetylsalicylic acid) is an inhibitor of both prostaglandin synthesis and platelet aggregation. The differences in activity between aspirin and salicylic acid are thought to be due to the acetyl group on the aspirin molecule. This acetyl group is responsible for the inactivation of cyclo-oxygenase via acetylation.Omeprazole belongs to a class of antisecretory compounds, the substituted benzimidazoles, that suppress gastric acid secretion by specific inhibition of the [H+/K+]-ATPase enzyme system at the secretory surface of the gastric parietal cell. Because this enzyme system is regarded as the acid (proton) pump within the gastric mucosa, omeprazole has been characterized as a gastric acid-pump inhibitor, in that it blocks the final step of acid production. This effect is dose-related and leads to inhibition of both basal and stimulated acid secretion irrespective of the stimulus. CYP2C19, a polymorphic enzyme, is involved in the metabolism of omeprazole. The CYP2C19*1 allele is fully functional while the CYP2C19*2 and *3 alleles are nonfunctional. There are other alleles associated with no or reduced enzymatic function. Patients carrying two fully functional alleles are extensive metabolizers and those carrying two loss-of-function alleles are poor metabolizers. In extensive metabolizers, omeprazole is primarily metabolized by CYP2C19. The systemic exposure to omeprazole varies with a patient's metabolism status: poor metabolizers > intermediate metabolizers > extensive metabolizers. Approximately 3% of Caucasians and 15 to 20% of Asians are CYP2C19 poor metabolizers.In a pharmacokinetic study of single 20 mg omeprazole dose, the AUC of omeprazole in Asian subjects was approximately four-fold of that in Caucasians [see Use in Specific Populations (8.8)]. Storage: Store at 25°C (77°F); excursions permitted to 15-30°C (59 to 86°F) [see USP Controlled Room Temperature]. Store in the original container with desiccant and keep the bottle tightly closed to protect from moisture. Dispense in a tight container if package is subdivided. Advise the patient to read the FDA-approved patient labeling (Medication Guide).Inform patients, families, or caregivers of the following before initiating therapy with YOSPRALA and periodically during the course of ongoing therapy.